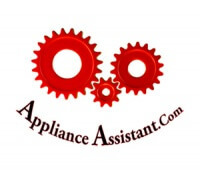 So your ice maker’s slacking off again and your looking for some payback…well you’ve come to the right place. On this page you will learn how to whip that lazy ice maker back into shape and have it pumping out cubes faster than a kid in a Rubik tournament! 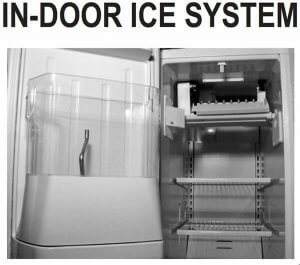 The Whirlpool & Kitchen Aid in-door ice system is very nice design because it frees up a large amount of space in the freezer compartment and makes important job of dumping old ice much more convenient. Mechanically, this is a Whirlpool modular ice maker with a few extra trim pieces, different fill tube location, and a set of control boards have replaced the bail arm switch. 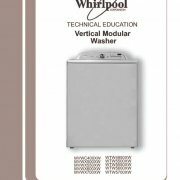 One other important note… Whirlpool redesigned the optics portion of this system around 2002 so there are two different diagnostic methods depending on which set of boards are installed in your refrigerator, pre or post 2002 ice maker models. First thing is first! Lets not make more work for ourselves than we have to. Is the on of switch, located on the right side ice maker control slid to the on position? An invisible beam of infrared light is sent across the top of the ice bin to detect if the bin is full of ice. The on/off switch is a slide that will block the beam and stop ice production. Is the ice bin full? Hmmm. Could there be grime or frost on ether the emitter or receiver board windows that may block the light beam’s round trip? Note: The ice bin must be installed on the door to activate the left side flap, ice should not be over the top notches of the bin. 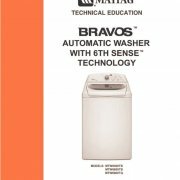 If you don’t get any response from the diagnostic test… wait 5 minutes then unplug the refrigerator for 10 seconds to reset the ice maker control board and try again. Step 1. Open the freezer door (make sure that the freezer door has been closed for a minimum of 10 seconds prior to opening the door). Step 2. Activate the door switch 3 times. Push the button in completely for 1 second each time. Step 3. Close the freezer door for a minimum of 5 seconds for a maximum of 50 seconds. Step 4. Open the freezer door and immediately view the diagnostics red status light next to the ice maker’s on/off switch. -Two flashes repeated once means the ice maker’s optics are blocked or defective. -A steady on light for 5 seconds means the ice maker’s optics boards are working properly. -If there is no light try resetting the optics boards as in the note at the top of this section. If there is still no light you may need a new set of optics boards, or the LED light is out. Boards purchased from this link have a 1 Year Return Policy! No questions asked, installed or not! Step 1. Open the freezer door and observe the red status light next to the ice maker’s on/off switch. You should see two flashes and a one second delay repeating. If there is no light your LED light may be out, you may have pre 2002 boards installed, or the optics boards need to be replaced. Step 2. Close the left side flapper door and make sure you are not blocking the optics board’s light path. The red status light should be steady on. If the light continues to flash, your optics are either blocked in some way or they need to be replaced. Boards purchased from this link have a 1-year warranty, no questions asked, installed or not! 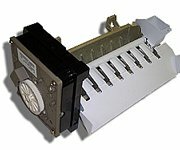 This style of icemaker is mounted sideways at the top of the freezer compartment and is covered by a door flap. There is also a spring-loaded flap on the left side of the freezer that will open and block the emitter board whenever the freezer door is opened. This will break power to the ice maker whenever the door is opened and keep you from getting showered with freshly produced ice cubes when you’re grabbing some tasty treat. Step 2. Remove the ice maker cover by applying sideways pressure and pulling slightly. Step 3. Remove one ¼” screw from that right bottom of the ice maker that secures the wire harness cover. Then remove the cover by pulling it toward the back of the freezer. Step 4. 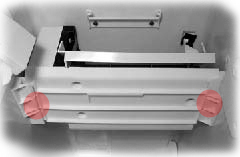 Locate two plastic tabs on the bottom of the ice maker mounting bracket. Apply pressure to both tabs while pulling the ice maker forward. You will feel some resistance from the water fill tube at the top of the ice maker, but fear not it’s flexible and will give. Step5. Unplug the wire harness. 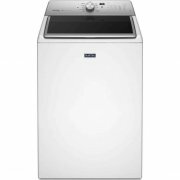 You now have an ice maker in your hands… Now what? 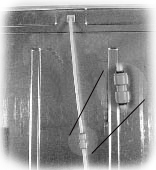 Take a look at “Ice Maker Test Points” for more testing help. The Whirlpool modular ice maker mechanics are examined in detail at this link “Whirlpool modular icemaker” Note: the in-door ice system ice maker differs from the ice maker described in this video in the following ways: There are several additional trim pieces that direct air flow and direct ice into the door bin as it harvests. It also has a slightly different fill cup for top fill vs. rear fill. Step 1. Remove the ice maker. There are quite a few elements that deliver ice from the bin to your glass so here is an overview of the process and the components involved. Is the dispenser lock button on? Does your freezer light switch work? 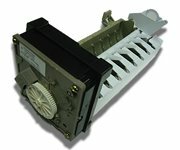 You may have a power supply problem in the dispenser switch pack or the motor has completely given up. (Shock Hazard! Voltage must be present for these tests. 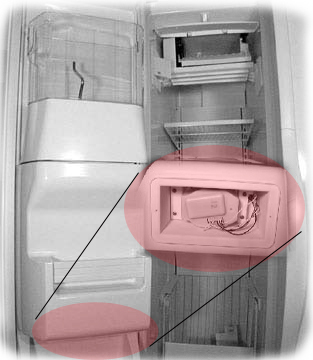 )You can check the motor for voltage by removing the motor cover at the bottom of that big blank bulge in your freezer door. (Double check your wire diagram for test points and wire colors.) 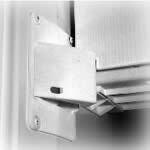 Your freezer door switch needs to be taped closed so that power is supplied to the circuit. Then with the motor plugged in check for 115 ACV from the two center contacts. (Usually blue and white) when the ice dispenser paddle is depressed. Next check for VDC 115 across the two right most connections and the two left most connections (Orange/Blue to Pink/Black) and (Red/White to Brown/White) when the ice dispenser paddle is depressed, on both crushed and cubed settings. 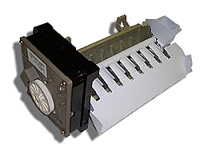 Take a look at the dispenser strip circuits below. Remove the ice bin and also remove the bracket that holds the drive coupling from the motor into place. Now pull the drive shaft up and out, close the door and try it again if the motor is still just humming you probably need to replace the dispensing motor. If that fixed it, check that the arm in the ice bin moves freely and look for anything that might cause the shaft to bind up.